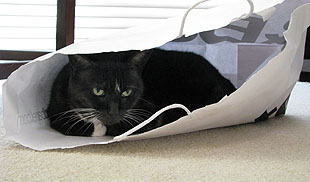 Marian went to Crate & Barrel the other day and got something for everyone. For us, new soup bowls. For Domino, a fabulous new hidey hole. 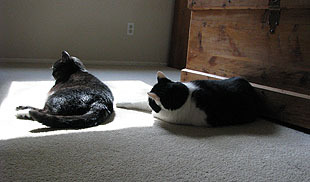 The next day, however, it was back upstairs to snooze in the sunny spot by the bedroom window. Unfortunately, Inkblot decided to join her, and eventually his roving paw got the best of him. This all turned out badly a few seconds after I snapped this picture, but Inkblot seemed pretty pleased with himself. After all, when Domino fled he was able to take over the entire sunny patch for himself. And he did. UPDATE: Support Friday Catblogging! Our fundraising drive continues all weekend. Click here to donate by PayPal or here to donate by credit card.